Do You Need Some Color in Your Life? As a Personal Stylist, I know firsthand that many people aren’t experts in matching complementary colors for their wardrobe. Well, I want to help you overcome that challenge! 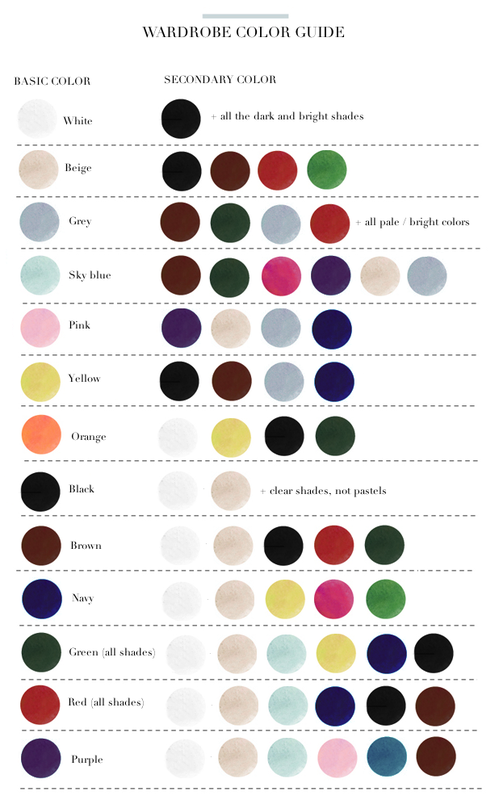 Below you'll find a handy quick-reference wardrobe color guide that shows you how to pair basic colors (including neutrals with) secondary colors. This is particularly helpful if you’re thinking about stepping out of your ‘safe' color zone or when you’re out shopping and are looking for potential color matches. I also recommend printing it out and keeping a copy in your closet for easy reference. You can have fun using this for your jackets, blouses, pants, shoes, gloves, scarves…the list goes on and on! I challenge you to revisit your closet this color guide and experiment with trying out new color combinations that you might not have thought of before. Good luck!